We love this chart from Dan Frommer at SplatF. 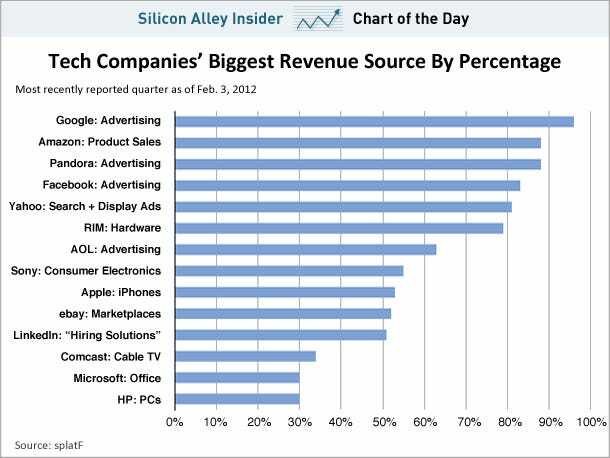 Google gets over 90% of its revenue from one source: Advertising. The next closest is Amazon with product sales. But, Amazon’s product sales are a mix of goods, so it’s not exactly the same as relying on just advertising. For now, this isn’t a big problem for Google. The online ad market is still growing, and Google can capture a lot of the market. But, if things were to change, or advertising were to slow down, then look out. THE APPLE INVESTOR: How Much Is Apple Worth?